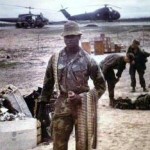 March 5, 1969 Robert Henry Jenkins, Jr., Medal of Honor recipient, was killed in action. Jenkins was born June 1, 1948 in Interlachen, Florida. He enlisted in the United States Marine Corps in 1968 and within two months was promoted to private first class. On March 5, 1969, while serving as a Marine Gunner with Company C, 3rd Reconnaissance Battalion, 3rd Marine Division in the Republic of Vietnam, Jenkins’ actions earned him the medal. His citation partially reads: “the Marines were assaulted by a North Vietnamese Army platoon employing mortar, automatic weapons, and hand grenades. Reacting instantly, pfc. Jenkins and another Marine quickly moved into a two-man fighting emplacement, and as they boldly delivered accurate machine gun fire against the enemy, a North Vietnamese soldier threw a hand grenade into the friendly emplacement. Fully realizing the inevitable results of his action, pfc. Jenkins quickly seized his comrade, and pushing the man to the ground, he leaped on top of the Marine to shield him from the explosion. Absorbing the full impact of the detonation, pfc. Jenkins was seriously injured and subsequently succumbed to his wounds.” The Medal of Honor, America’s highest military decoration, was presented to Jenkins’ family on April 20, 1970.